Our calculator tool is down for repair. Please call 1-855-971-9061 or submit a form for more information on Solar Power pricing. The solar power calculator on this page is designed to help you determine the cost and benefits of using solar power to fuel your home or small business. Our tool provides a rough estimate about daily solar power generation (in kilowatts per hour) and potential energy cost savings. You’ll want to have your most recent power bill on hand to help you complete the empty fields. Note: the solar power calculator may not be accurate for all households and situations. It’s meant to provide an estimate for educational purposes only. Solar power providers may provide a more accurate and comprehensive energy-savings quote. To speak directly with a solar power provider, call: 1-855-971-9061. By clicking calculate, you give a solarpowerauthority.com representative your consent to use automated technology to call you or email you using the information you provide. You are not required to provide this consent to make a purchase from us. Enter the total monthly amount from your last power bill. Enter the cost per kWh that the utility company charged you for. Use the “Solar System” drop-down menu to select the size of your solar system, from 1 kW to 10 kW. The bigger your solar system, the more solar power it can potentially generate under sunny skies. Type in the average number of hours of peak sunlight that are available at your location. More sunlight means you can generate more power each day. You also have the option to enter your feed-in tariff per kWh. Click the “Calculate” button to instantly get your estimated solar power results. the solar power calculations are based on your system running at 80 percent efficiency. The free solar panel cost calculator will tell you the daily generation in kWh, your daily savings, as well as your kWh use and generation per month. Below are a set of definitions to reference while you read the report. These terms will illuminate key phrases you should know to best understand the results. Solar radiance: Solar radiance (insulation) is the amount of solar energy received by a given surface area in a given time period, commonly expressed in kilowatt-hours per square meter per day (kWh/sqm/day). This measurement varies according to the weather and latitude of a given location. Average monthly usage: This is the amount of electricity you consume in an average month. It is determined by the solar calculator either by the amount you put in, or approximated by dividing the amount of your electricity bill by the cost-per-kilowatt-hour for your area. System size: This approximation tells you what you need for a solar power system to produce enough electricity to offset your annual electricity use. It is determined by taking your average daily electrical use and dividing it by your solar radiance, multiplied by 71%. The 71% factor is necessary to approximate the inherit inefficiencies in solar power systems. Roof size: This is the approximate roof size needed with exposure to the sun, in order to accommodate your solar power system. It can be determined by taking the size of the system and dividing that by 10 to get square footage (based on 10 Watts per square foot). Estimated solar installation costs: The approximate costs are based on $9 per Watt. This is an average rate, including parts and installation, for systems above 2kW. 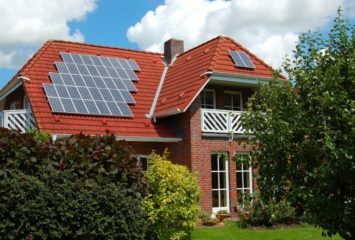 Cost of installing solar panels after rebates and incentives: This is an estimate of costs based on the available solar credits and solar rebates for your geographical area. This includes kWh production incentives for up to 25 years, if available in your region. It also provides an approximation of your local and state incentives. Average monthly savings: Calculated for post-installation of solar panels on your house or commercial property. 25-year savings: Based on what you save over a 25-year period, assuming a yearly 4% increase in utility rates. You can also calculate a 25-year return on investment (ROI) for installing solar panels, and your break-even point in a number of years. Hopefully, your solar quote helps determine whether or not solar energy is a feasible investment for your home or small business. If you want to learn more about solar power energy, read the related articles below.